A captive fisher at Northwest Trek Wildlife Park. 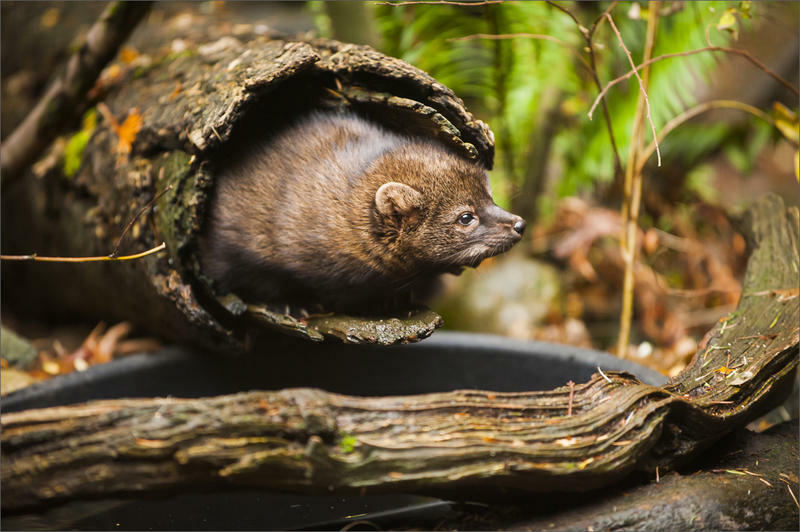 Fisher reintroduction in Washington began in Olympic National Park. That worked, so now the focus is on returning the fisher to its historical range in the Cascade Mountains. For this phase, 69 of the medium-sized weasels were captured in British Columbia. All were implanted with small radio beacons before release between late 2015 and early 2017 near Longmire, in Mount Rainier National Park and at a second location south of Randle, Washington. Those transmitter signals can be picked up from a small airplane bristling with antennas, such as the one Northwest Trek Wildlife Park chartered this week. Pilot Jeff Well and biologist Rachael Mueller with the fisher survey plane at Pierce County's Thun Field. Notice the antennas on the wing struts. On a survey flight Tuesday, Northwest Trek Conservation Program Coordinator Rachael Mueller listened for faint beeps through the static along with pilot Jeff Well as he flew at low altitude past Mount Rainier and then skimmed over national forest down to Mount Adams and Mount St. Helens. Well banked the single engine Cessna into tight circles — or sometimes a figure eight pattern—to help the biologist pinpoint a fisher's location. The duo tracked down three females and one male fisher during the four-hour flight. The fishers, who are about the size of a house cat, are detected but not seen from the air. The elusive weasels have dispersed widely, with some traveling many valleys away from where they were released. Mueller is eager to learn if the fishers are reproducing. A telltale sign would be if the home range of a female shrinks down by a lot. “That would be very exciting at this point,” Mueller added. "I'm hopeful with a few more flights that we'll have some indications that some females are denning and have kits," Washington Department of Fish and Wildlife project lead Jeff Lewis said in an interview Wednesday. Time is of the essence because the radio transmitters on the fishers are giving out. 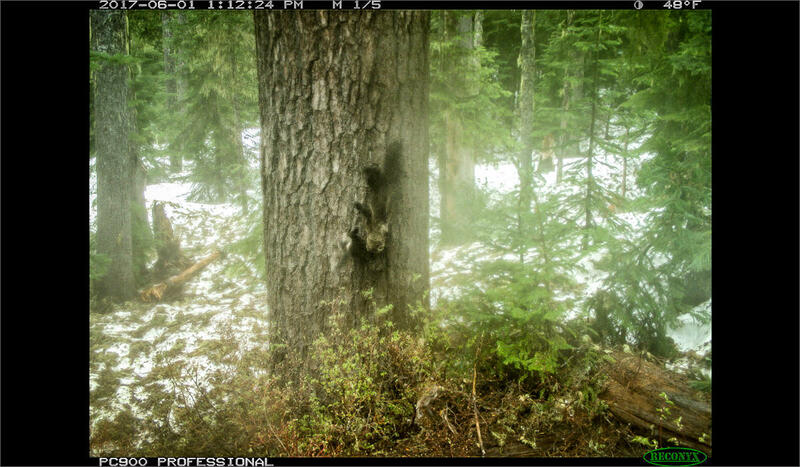 A remote motion-sensor camera captured a photo last year of a reintroduced fisher carrying a newborn kit to its den, the first and so far only documented instance of successful reproduction in the South Cascades cohort. This image of a young female fisher with her kit is the first evidence that the animal is reproducing in the Cascades. 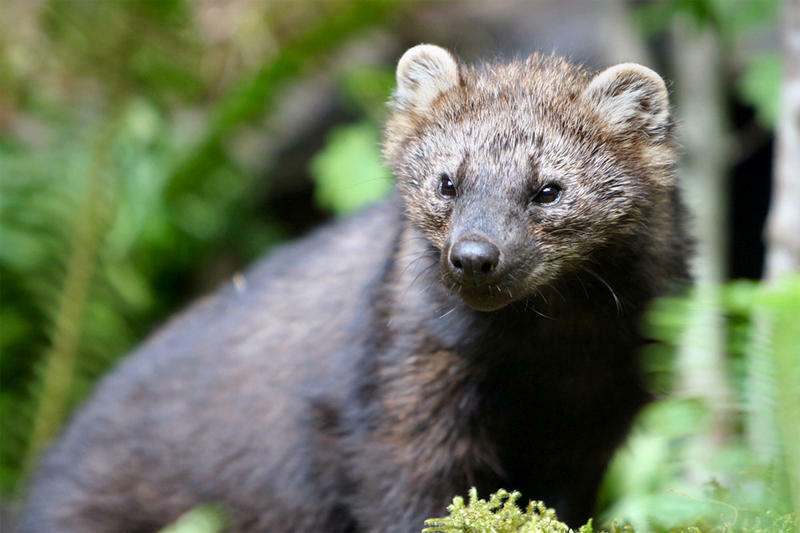 More fisher reintroductions were planned for Washington's North Cascades this past winter, but that expansion of the project is temporarily on hold. The state Department of Fish and Wildlife needs to line up a new source of animals for relocation. Massive wildfires swept through the previous fisher trapping area in central British Columbia last summer. "We're looking elsewhere for fishers," Lewis said. "We're hoping we can do that (North Cascades reintroduction) this coming fall. If not this year, then next year." 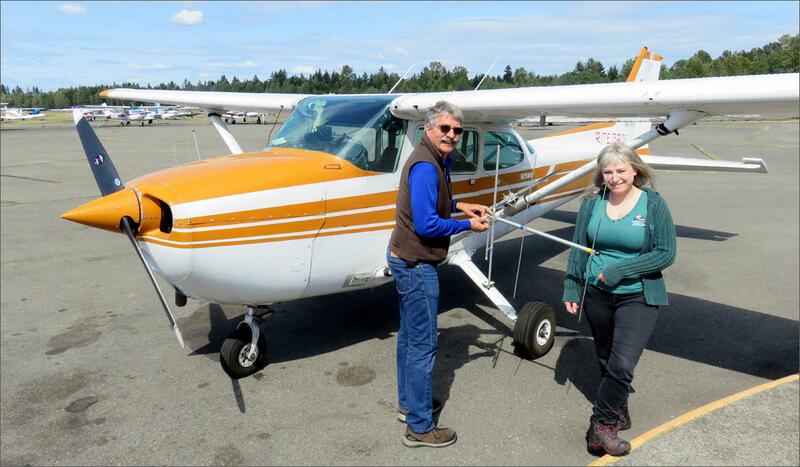 This week's aerial survey funded by Northwest Trek is one of at least six the Eatonville, Washington, wildlife park is sponsoring this year using money from its foundation, nonprofit partners and donations made by visitors last year. Most of the time, WDFW uses its own taxpayer-funded airplane to document the status of fisher recovery. "We try to fly about once a week, year-round," Lewis said. "The weather doesn't allow us to do that every week though." Other participants in the reintroduction effort include the nonprofit Conservation Northwest and the National Park Service. The U.S. Fish and Wildlife Service and Washington's National Park Fund contributed additional support. Fishers were once widely distributed through the forests of Washington and Oregon. Fur trapping, indiscriminate poisoning of predators and habitat loss through logging contributed to their decline in the Pacific Northwest. "They were completely wiped out of this state about 70 years ago or so,” Mueller said. “I am just extremely excited to be a part of bringing them back here into the state." A remnant population survived in the Klamath Mountains of southwestern Oregon and northern California. The Oregon Department of Fish and Wildlife successfully reintroduced a second population of fishers near Crater Lake National Park between 1977 and 1981. In 2015, ODFW published a feasibility study that concluded fishers would be good candidates for reintroduction to more of the Oregon Cascades and to the Coast Range. Fishers prey on snowshoe hares, porcupines and other rodents such as squirrels.